Culross Pottery and Gallery actively supports Fair Trade both at home and abroad. Having worked in overseas development herself, Camilla feels strongly about making sure the money for these products goes to the people who actually make them. She does this by selling a selection of beautifully made goods at the gallery from oversaes producers including: Traidcraft - a charity helping small-scale manufactures in developing countries. 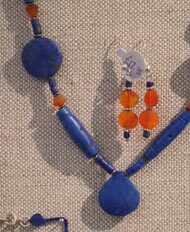 We stock a selection of their products From Travels Afar - jewellery from Thailand and India Kazuri Beads - ceramic beads produced by a woman’s group in Kenya Afganistan jewellery - lapis lazuli and other gemstones combined with silver to make stunning jewellery.